July 28, 2018 by The Junkie 0 comments on "How to Say “I want to Learn Russian” 10+ Phrases & Lessons Inside"
Do you really want learn it? And how do you say that in Russian? You say “Ya h’achu viuchit’ russkiy.” In Russian, that would look like this: Я хочу выучить русский. 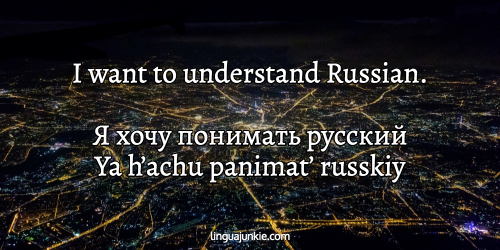 In this article, you will indeed learn some Russian. 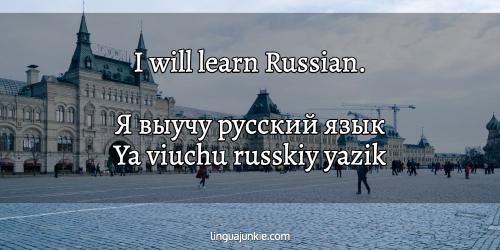 You will: ① learn how to say “I want to learn Russian” in many ways, and ② actually get some ways to learn Russian: Apps, Textbooks and Russian courses. First, let’s learn how to say “I want” in Russian. 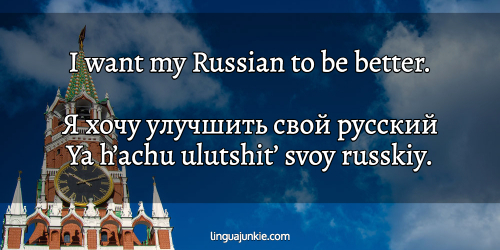 If you say “I want to learn Russian” you better know how to say “want.” Here’s how: Я хочу … (Ya h’achu…). “Я” is “I” and “хочу” is “want.” It’s just like in English. And the good news is that it’s the same for all genders. By the way, you should also HEAR some real Russian. So, while you read this lesson, listen to this free Russian Audio Lesson. It’s a bit unrelated but you will learn Russian greetings. Now, onto the “I want to learn Russian” phrases. 1. I want to learn Russian. We already know the how to say the first part of the sentence, now we’re going to discuss the rest of it. Remember that the (t’) sound you see above is a softer “t” than the one we’re used to pronounce in English. 2. 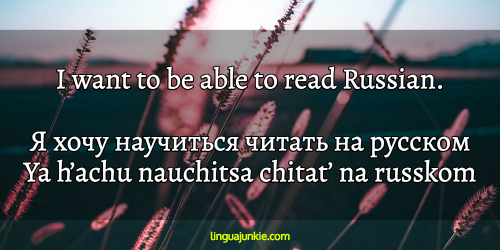 I want to be able to read Russian. 3. I want to speak Russian. 4. I will learn Russian. 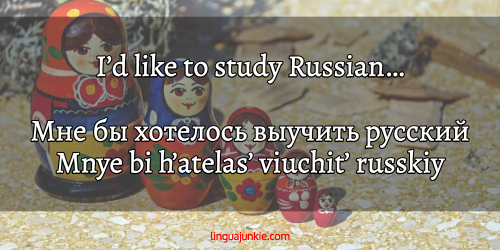 You can say this phrase when you’re sure that you can and you will learn the Russian language. 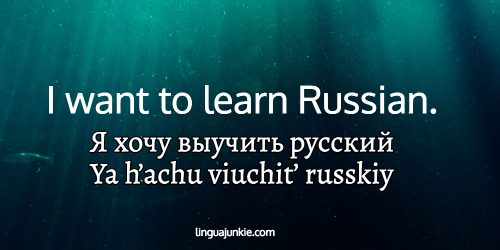 “выучу” (viuchu) is a verb in the future form meaning “I will learn” and “русский язык” (russkiy yazik) is “Russian language” just as easy! 5. I want my Russian to be better. Ya h’achu ulutshit’ svoy russkiy. 6. I want to speak Russian better. This one is good for the case when you want to improve your Russian speaking skills. “luchshe” (luchshe) is simply “better.” All the other words in this sentence are already familiar to job. Good job! 7. I want to speak Russian fluently. 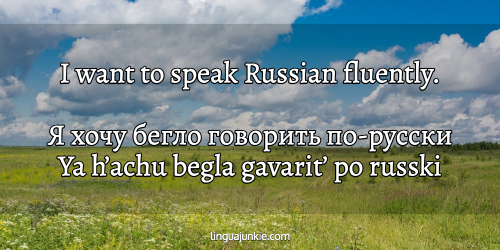 In this sentence the word “бегло” (begla) has the meaning of “fluently.” Remember this one because it’s your goal! 8. I want to understand Russian. The only new word for you here is “понимать” (panimat’) and it can be translated as “to understand” in English. 9. I’ll start studying Russian today. Don’t just say it – dot it! Start doing your first steps this very day and you’ll see how your Russian becomes better. 10. I dream of learning Russian. Learn and memorize the phrases in this article and you’ll approach a few steps closer to your dream to come true. If you want to say that you dream of something in Russian say “Я мечтаю” (ya mechtayu) – “I dream.” Pretty easy, isn’t it? And one more thing we should note here is the Russian particle “бы” (bih) which means “would, could have.” In this case it is used to express a wish or a desire to do something. 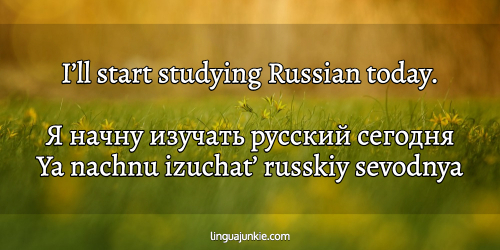 This example is another way to express your desire to learn Russian. Был бы неплохо поехать в отпуск (Byla bih neploh’a poeh’at’ v otpusk) – I would be nice if we could go on a holiday. Было бы неплохо, если бы вы приехали навестить нас (byla bih neploh’a, esli bih vy prieh’ali navestit’ nas) – It would be great if you could come and visit us. You can also talk about reading, speaking and understanding this language. Just re-read and repeat these lines some more if you want to master them. But wait, what’s that? You say you want to learn MORE? P.S. 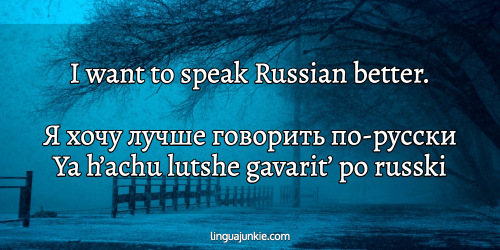 Want to learn & speak the Russian language? Check out RussianPod101, a complete Russian learning program with 1,000+ audio and video lessons, apps, study tools, eBooks and PDF lesson notes. I think their lessons can and will help you learn and speak Russian.